Een perfect gelegen villa die een vakantie biedt met echt geen auto nodig! We had a very enjoyable stay. The villa was clean, comfortable and well maintained and when we had a small problem with the washing machine Felix came out as soon as possible to sort it our for us. we are so glad you had a lovely stay with us. Its lovely for future guests to read about the villa, its location and standards. This is our second stay in this Villa this year and we are booked for next year. The Villa is in such a great location, though only 5 Minutes walk from Coral bay strip the villa is in a nice quiet area. It made for a great stay for our hole family and has all we need for a relaxing holiday. the villa is clean and tidy the outside area is great for us all with a shaded area sun lounges and pool so we can all be together what ever we are doing. Lisa has always been so helpful with all our booking details and information. if you are looking for a home from home with all you need for a family or couple holiday with out having to go to far to amenities this is the place for you. we are looking forward to returning in May and many more times in the future. From booking the Villa Lisa was so helpful. Fantastic villa, very clean & tidy. There was a welcome pack waiting for us with essentials which was really appreciated! Great location for restaurants & bars in the main strip. Transport by bus into Paphos so easy so car hire is not needed. Had a great family holiday. Would highly recommend & will definitely be returning! we are so glad you had a lovely stay with us. It great for future guests to hear about the standard of the villa and its location and that genuinely everything is within an easy walk. We travelled as a family of 6. From our very first enquiry, Lisa and Felix were great. They were on hand for any questions we may have. On our arrival there was a complimentary welcome pack of cheese, ham, butter, jam, bread, water and milk tea and coffee which was a lovely touch. The villa itself has everything you could possibly need, there is air con in every room. The kitchen is well equipped from a kettle and toaster, cooker and dishwasher right down to foil and cling film. We did have a small issue with the washing machine, but after a quick text to Lisa and Felix, there was someone round to fix it within a couple of hours (we didn't need to wait in either) The veranda outside both bedrooms is amazing, with views of the sea from various angles, there is a table and chairs for alfresco dining and Comfy chairs /sofa and table for relaxing. It has the sun all day into the evening, great for morning coffee, early evening relaxing before venturing out and even late night chats with a glass or two. The pool has the sun also for the entire day and is very private. It was like getting into a warm bath. Absolute bliss and believe me we made good use of it. The pool guy came a number of times to check water and clean around the pool. There are plenty of sunbeds and umbrellas around the pool also, and shaded area with table and chairs. The villa is in a perfect location, a 1 minute walk to your first friendly bar (but you cannot hear anthing from the villa) and then a couple more minutes upto the main strip. If you go to philipos supermarket (just up from the strip) they will fetch you back with your shopping free of charge (we just gave the driver a tip). There are frequent buses to Paphos so no need for a car and Coral bay beach is just 20 mins walk down the strip. whilst we were there, I messaged Lisa and Felix to see if they had any smaller villas (as myself and hubby want to return next year on our own, now the boys have grown up) yet again we had a reply in no time. We loved it here that much we've already booked for next year. Do not hesitate to book this villa it's great and if we come as a family again we would not think twice about bookng it. Thank you Lisa and Felix for such wonderful stress free stay. Its great for future guests to hear about the location, layout, cleanliness, pool etc plus for them to hear about the local supermarket and the complimentary drop off of you and your shopping. we are very lucky with our bus service. We had a lovely stay at the Villa. 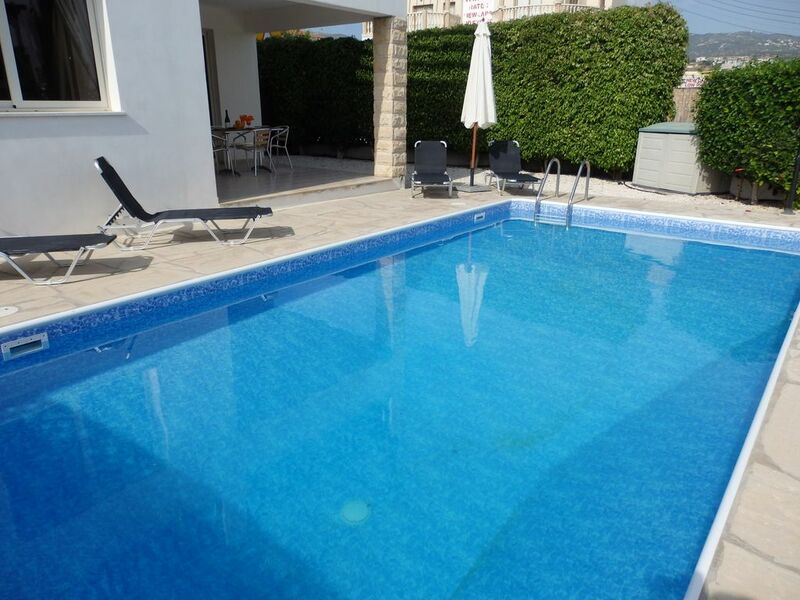 the Villa and Pool were very clean and in a great location. Lisa And Felix were very helpful all though the process of out booking and holiday, we hired a car as we like to go of sight seeing but you dont need one as it is a 5 min stroll to the Coral bay strip. We come to Coral bay twice a year as it has everything we need to enjoy our holiday and we look forward to coming back to this villa with our family in September. I would recommend staying in any of Lisa and Felix Villas. Many thanks to you both and look forward to our return. Many thanks for taking the time to write such a lovely review, we are so pleased you had a lovely stay with us. its lovely for future guests to read from someone who has stayed as to the location and genuinely not needing a car and the standards. Villa Potima View ligt in het hart van Coral Bay. Een korte wandeling brengt je naar de hoofdstrip van Coral Bay, waar tal van bars, restaurants en winkels te vinden zijn. Grote verscheidenheid aan gerechten allemaal op loopafstand van de lokale Cypriotische meze in Phidias Tavern tot Italiaanse, Mexicaanse, Chinese, Indiase en zelfs Japanse teppanyaki. Er is een strand op 2 minuten lopen naast het Aqua Sol hotel. Het Main Coral-strand ligt op 10 minuten lopen. Tal van watersporten hier beschikbaar van Jet Ski Hire tot para-verzenden en Banana Boat Thrill ritten. Er rijdt elke 15 minuten een geweldige busdienst van Coral Bay naar Paphos, die tot middernacht duurt.